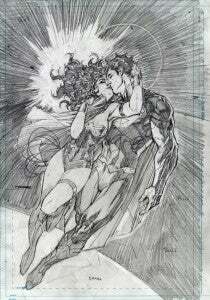 Jim Lee has debuted a first look at the second printing variant for Justice League #12, the issue released yesterday that featured, among other things, Superman and Wonder Woman locking lips for the first time in the world of the New 52. The publisher announced late yesterday that the issue had sold out at Diamond Comics Distributors and would go back for a second print with a new cover by the superstar artist, who is rumored to be departing Justice League in 2013. DC Comics released the image exclusively to Buzzfeed, but it's making the rounds on the Internet already with everyone seeming to play up the fact that the cover seems to have Wonder Woman "taking charge" of the make-out session. Not only were there some commentators on the Internet who felt Diana was somewhat subjugated in the first-print cover, but a famous pre-Flashpoint iteration of the relationship saw Superman make an advance on Wonder Woman in Action Comics #600 of which she was somewhat less than receptive. The relationship is promised to have a far-reaching impact on the DC Universe, not least of all for Booster Gold, a character from the future whose timeline is apparently somehow imperiled by the coming together of DC's two heaviest hitters. Justice League #12 is on sale now, although many stores have sold out. You can always try ComiXology. The second print will be along on September 26.